(Nanowerk News) The computer assisted design (CAD) tools that made it possible to fabricate integrated circuits with millions of transistors may soon be coming to the biological sciences. 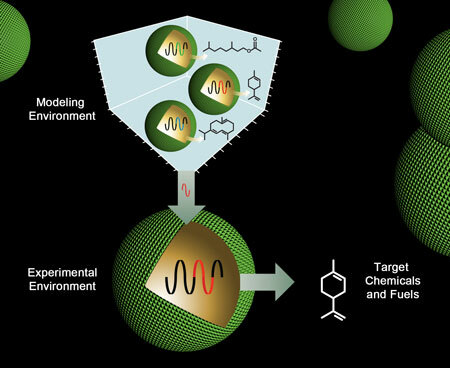 Researchers at the U.S. Department of Energy (DOE)'s Joint BioEnergy Institute (JBEI) have developed CAD-type models and simulations for RNA molecules that make it possible to engineer biological components or "RNA devices" for controlling genetic expression in microbes. This holds enormous potential for microbial-based sustainable production of advanced biofuels, biodegradable plastics, therapeutic drugs and a host of other goods now derived from petrochemicals. Keasling, Carothers and their co-authors focused their design-driven approach on RNA sequences that can fold into complicated three dimensional shapes, called ribozymes and aptazymes. Like proteins, ribozymes and aptazymes can bind metabolites, catalyze reactions and act to control gene expression in bacteria, yeast and mammalian cells. Using mechanistic models of biochemical function and kinetic biophysical simulations of RNA folding, ribozyme and aptazyme devices with quantitatively predictable functions were assembled from components that were characterized in vitro, in vivo and in silico. The models and design strategy were then verified by constructing 28 genetic expression devices for the Escherichia coli bacterium. When tested, these devices showed excellent agreement ? 94-percent correlation ? between predicted and measured gene expression levels.